Capitalist growth and industrialisation provoked an unprecedented change that affected Europe radically. The continuous changes affected Art too: communications are faster, photography makes possible to see things that the human eye could not appreciate. During the 19th century artists were known in the Salons or Exhibitions and the decision about of the admission of artists depended on a jury. 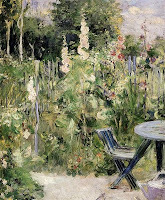 In 1863 the Refuses´ Salon was organised, taking part on it some painters formerly not accepted, such as Manet. It was born as an evolution of the French landscape school of the late 19th century. It is an answer to the new society and philosophy. Bourgeoisie has its own traditions and its way of entertaining and this is going to be one of the subjects of the Impressionism. Cities are the place where lazy pedestrians walk around, even during the night, with its traditional population such as cabaret singers, dancers, cafes. It is an attractive world from which the impressionists extracted their subjects. Impressionists’ paintings reflect the taste for landscape, boats, Sunday meetings. These painters gathered together around the figure of Manet, refused in the official salons. In front of the new language they defended the free brushstroke, separated into primary colours that must be mix in the eye. People reacted against this art but they counted with the backing of two emergent forces: art critics and marchands. The style has a precedent in the landscapes of the Barbizon School and the last French realism of Corot and Millet. In addition to this, they were influences by the colour and composition of the Spanish Golden Century. Japanese stamps in fashion at the time, added a new vision of the space and the use of flat colours. Finally, photography was also influential. The result is a cosy, light painting, normally of landscape, full of light and colour, with short brushstrokes that sometimes allow us to see the canvas. There are not big images because they are made under private commandment. They are far of any social compromise. -They use oil on canvas, even when sometimes they can use pastel on paper. -New subjects: they recover non important subjects, with an especial interest in landscape, both rural and urban; they want to capsize the fugacity. There are real landscapes, independently attractive or ugly. There are also non important things, as free time, dances, and pubs. They renounce to important subject, with message. -New valuation of colour. Colour does not exist, neither shape. The only real thing for the impressionist artist is the relation air-light. In this way the light is the real subject of the painting and this is why they repeat it during different hours or seasons. The quality and amount of light is what offers one or another configuration of the object. This is why they painted at open air and they used a fast way of painting to catch the changing effects. Paintings are luminous and light. -Colour is directly related to light. They use light colours, lively and pure that they apply directly on the canvas, one on the other, so the mix is made in the spectator’s eye. With this resource they gain in chromatic vivacity. Shades are not dark any longer and are reduced to spaces coloured with complementary colours, because in this way the main colour is intensified. -Free, short and fast brushstroke. It is a need for catching better the atmospheric effects. They do not like to modify the things and they prefer to use big and matter-abundant stains. Line disappears and the brushstrokes and colour are the dominant values. -The traditional model with graduating colours and light does not exist. As the time goes on the shapes will be dissolved into luminous and chromatic impacts. -Open air painting. It is marked by the subjects but more by the intention of finding a way of correcting the too mechanic composition of the studio. -New valuation of the illusionist space. They are not interested on deepness and the traditional conception of the painting as a window disappears. They want it to be alive, a piece of nature, so they escape from perspective and traditional composition. In many paintings the location of the elements, cutting characters and objects, is a photographic effect. Manet renounced to the academic tradition. 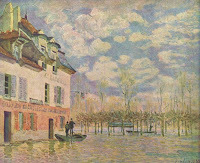 He presented in the Refuges Salon Dejeneur sur l´herbre, offering a vision of the light and composition his contemporaries were not prepared to see. The sensation of volume is not given with the chiaroscuro and the images are not located in a certain atmosphere but mixed with it. Other works are Olimpia and The Bar of the Folies Bergere. 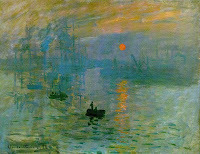 Monet is the most poetic of the impressionist, with a fluid conception of nature. One of his first objectives is the immediate visual sensation. This is why he chose aquatic elements, underlining the effects of light on the water. He was worried about light variations depending on the time, what led him to paint the same image at different hours: Rouen Cathedral. His painting Impression, soleil levant was used by a critic to refer to the work of these artists and the movement was named after it. 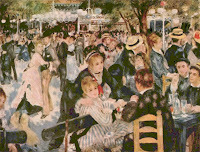 Renoir is a revolutionary and an artist of strong tradition. He used strong tonalities, red, and yellow and capsized the wavy movement of light on leaves and water. He preferred human motives, mainly women, to express beauty. Work: The Moulin de la Galette. Signac was influenced by the divisionism and studied carefully the effects of light achieving a great colour. He painted mainly landscapes. Degas is more an impressionist of the form than of the colour. In many of his paintings the light is substituted but that of candles. The tender clothes of the dances capsized the fugacity of the light. He considered that form has a value in itself and keeps its volume. He represented human images, mainly Dancers. Seurat tried to represent reality with a rigorous and scientific technique. He began the divisionism or pointillism. He represented the luminous vibration with the application of small dots that compose the unity of the image once perceived by the eye. This is the procedure use in his Dimanche Afternoon a la Grande Jatte.